For the past few weeks I’ve been attempting to get on with my writing and for the most part, have succeeded in doing that. I still have some distance to go before I finish Book 3, but it’s coming along reasonably well. Unfortunately, last week, we needed to visit my 87-year-old aunt in Carnforth (north Lancashire) who has been unwell recently, so my writing was again ‘on hold’. On one of the days we were there, we managed a run out to my hometown of Southport – a Victorian seaside town on the north-west coast of England. 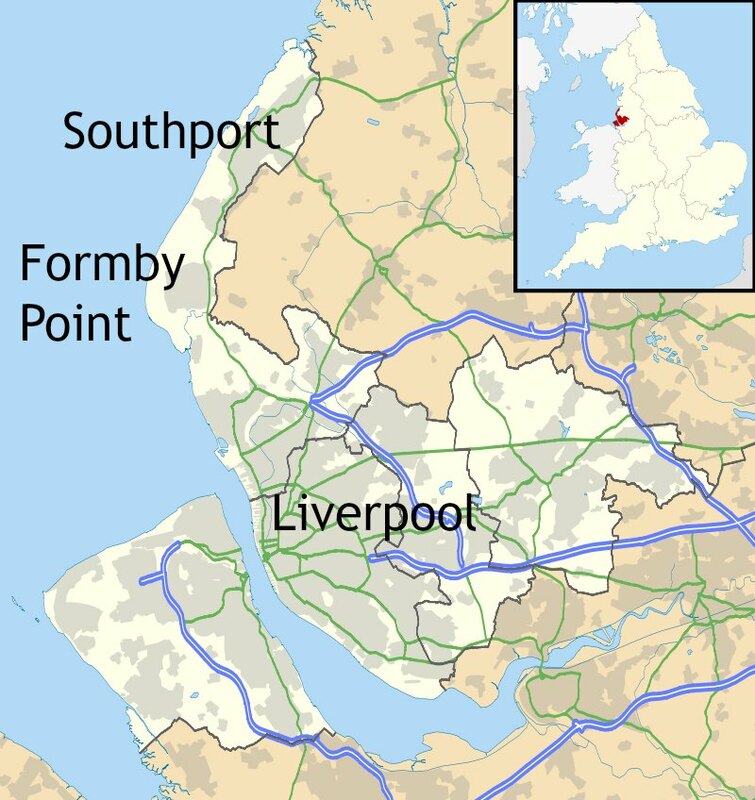 Map of Merseyside, UK. Source Ordnance Survey Open Data. Author Nilfanion. Creative Commons. Southport has had its ups and downs over the years, particularly since losing its place in Lancashire and becoming part of Mersyside in the early 1970s. I intend to write a post about the town at some stage, as I’ve always loved it and often long to be back there. Many golfers from around the world will know this coastal region for its famous links golf courses, including Royal Birkdale, Hillside and Ainsdale. On this occasion we first drove a little further down the coast to Formby Point, and I thought I’d share some photos of the sand dunes and pine woods there. This whole area of coastline is managed as a Special Area of Conservation (SAC). Parts of the stretch, at Ainsdale, a litttle closer to Southport than Formby, have been a Nature Reserve for many years now – even when I lived there in the 1950s and 60s. The Reserve is the habitat of the Great Crested Newt, Britain’s most protected species of amphibian. I believe its numbers are now on the increase at the Reserve. My sister and I often used to cycle down to the pine woods with a picnic when we were teenagers, and it hasn’t changed a lot since then – except that Formby Point is now managed by the National Trust. These are a few photos of our walk through the dunes before we reached the beach. The marram grass is essential to the conservation of the dunes – without it, the westerly winds would very quickly erode them. On another day we went to Blackpool – an even more desolate seaside town at this time of year. I’ll share a few photos of the town, and the adjoining Lytham St Annes another time. Previous Just Who Was Saint Valentine? This is so interesting Millie! I can’t wait to hear more about Southport down the road. I have never heard of a red squirrel. It is so neat how you can catch glimpses of them in the feeders. It looks like a lovely place. Thanks, Antonia. The red squirrels have had a hard time surviving over the years, for many reasons – one being competition from the bigger grey squirrels which were introduced here from North America. But it can’t all be blamed on the greys. There are many reasons for the decline in the reds – including deforestation, particularly of coniferous woodlands, the red squirrels’ natural habitat. I could probably do a post about it all at some stage. I love the red squirrel. Smaller and more cute than its grey cousin. Very interesting info and beautiful photos! Great pictures Millie. I love the seaside and I love nature walks so it was right up my street! I love the seaside. I was talking about it this evening with my friend and we both agreed there is no finer place…. The seaside has its own special smell and ‘feel’. The sound of the sea is amazing, too. I suppose I should say, it appeals to all of the senses – even in February. You have some lovely beaches down there, too, although I can’t think of any with sand dunes, offhand. I really like beaches backed by cliffs, like many in Cornwall and South Wales. I have to agree that I do not know many with dunes either, however I am going to the seaside in a few weeks time so maybe I might get lucky and hit gold!! Hope you have a great time, wherever it is. A visit to the seaside works wonders for me. I come back feeling rejuvenated! Haha. Hope you find your gold. Absolutely. The sea air and fish and chips is a tonic for anyones soul….! Hi Millie, so lovely to hear from you 🙂 . I thought that you were writing…hope it is all going well. Hi Lina. Yes, it’s been a while since I was on my blog – and I was really missing it! My book is coming along quite well, although I’ve also been working on a book of short stories and flash fiction. So I’ve been quite busy! I’d like to get both published later this year. My aunt will never really be well again, unfortunately. She’s already had two strokes, so when she gets ill, we have to get over there quickly. She’s 87, and I’d never forgive myself if anything awful happened and I hadn’t seen her for ages. What a wonderful place, Millie! I love it, I love sea and squirrels! Beautiful shore Millie! Sorry to hear about your aunt. And congratulations on your book progress! 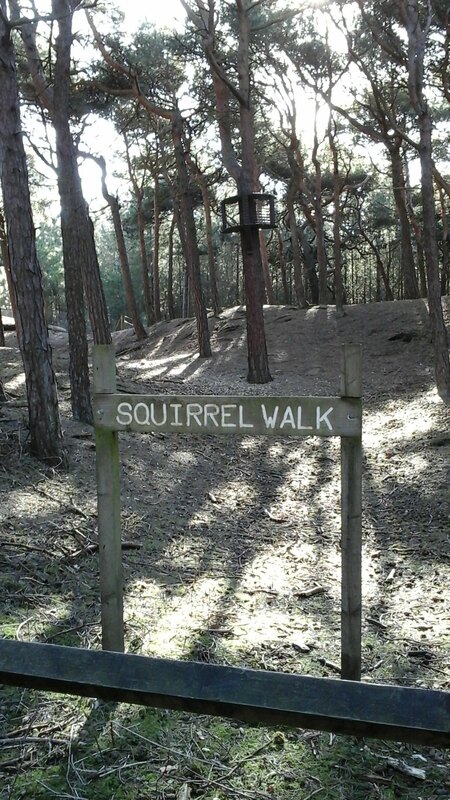 Squirrel walk, that’s funny. I feel like I have a squirrel farm in my back yard. Thank you, Sadie. 🙂 I love watching squirrels – grey or red ones. Red ones are very rare now in England, and only to be found in certain areas of coniferous forest, like Formby, and Kielder Forest. Grey squirrels are common in many places, and their natural habitat is deciduous woodland. I never thought about it, but we do have a few Pines in the yard. Although in the winter we can see several of their summer nests up in the trees that lose all of their leaves. I’ve never counted how many, I should give it a try. Lovely post, Millie, and such beautiful photos! So sorry to hear your aunt is not feeling well — I hope she is better. Sending hugs. Lots of hugs to you too, Anna, and thank you for the lovely comment. My aunt isn’t at all well, and we’re at that awful stage of not wanting to stay away from her for too long. Thanks, Anna. My aunt has aged terribly since the last stroke, and not only has limited mobility, but her hearing is very poor. We keep popping over there, but on days when the physiotherapist or other medical people visit, she always insists we go out. Thank you for your kind wishes – much appreciated. Old age can be very harsh sometimes. So very sorry to hear about your aunt’s health — you are all in my prayers. Lovely photos! 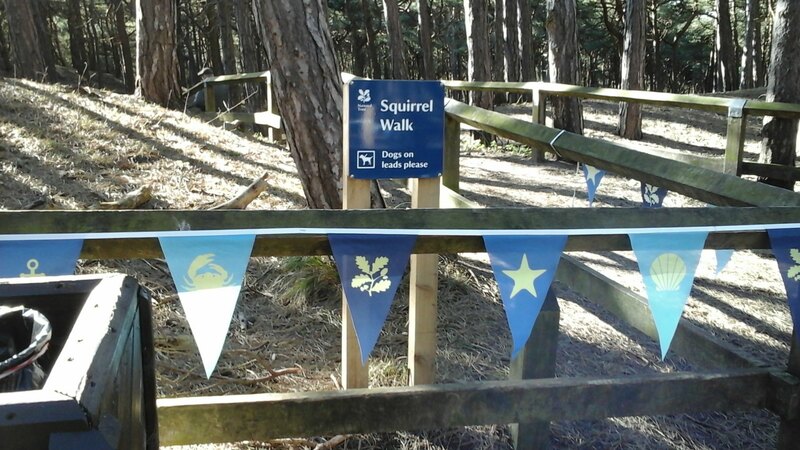 I like “Squirrel Walk” :-). I’m not sure I’ve ever even seen a red squirrel. Maybe when I was younger. It’s all American imports these days! I love beaches in the winter, this is no exception. Around here we have grey squirrels and chipmunks but I’ve seen black-tailed squirrels in South Carolina. Charley thinks the golf links would make a marvelous vacation and I love the nature preserve. So it could happen!Glad to hear you’re continuing with the 3rd book. Sometimes a rest is the best thing. Hi Clare! I feel a bit like an errant schoolgirl right now. I haven’t been on my blog for a few weeks. I really need to get on with this book – it’s well over a year since Book 2 was published on Amazon and I’m so behind with Book 3. I’m sure you would both love this coast, Clare (preferably in the summer). If Charley’s into golf, you’d be well away! As for wild life, I’d love to see black-tailed squirrels and chipmunks! Hope your writing is coming along well, too. I’ll be visiting your blog this weekend – before I disappear again for a while. Unfortunately, needs must, as they say. I haven’t done many posts since Christmas, Clare, and please don’t think you need to read the earlier ones. Your writing must come first. I made the mistake last year of spending far too much time on WP and neglecting my book. I really have to make up for it this year. It’s turned colder again here, too, with sleety snow today. We’re forecast for warmer weather by the ens of the week. Cambridge is a lovely city. It’s straight down the A1 from Newark, and we go quite often. I’d love to see photos of your coastline, too. There’s something wonderful about all coasts. Talk again soon . . .
Oh,, Milly, I love reading all of your posts and catching up. I want to read the older ones. I am reading the new Elizabeth George mystery. (taking a break from writing) and I recognize some of the places in your posts. Perhaps I should read some of Elizabeth George’s books. I’ve no idea which parts of the country she writes about, although I’ve seen a few Inspector Lynley stories on TV. One of them was set in Lancashire, but I don’t think they all were. I’m having a few days on my blog before I go back to writing, too, Clare. I’m in the mood for reading a few posts right now, so I’ll definitely pop over during the early part of the week. Yes, I read at night in bed, too. It’s not good to take the computer to bed. It ruins sleep patterns.When I go upstairs tonight, I’ll tell you the places I recognized. Book Lynley and PBS Lynley are different characters. Some of her books, I really didn’t like, but I’ve loved all of the tv series. We watched the Lynley series some years ago, and they do look a bit dated now. (They keep putting repeats on TV.) The storyline is different to many detective series in that Lynleyis a ‘lord’.We always enjoyed them at the time. Plots and characters in films and TV series are rarely anything like the ones in the books they’re based on. Sometimes that can be a good thing, but sometimes not, I suppose. Her latest book (2015) is “a banquet of consequences”. Some of the settings mentioned are:Spitalsfields, Dorset, Shaftesbury,Yetminster, Sherborne, Seaton, Camberwell. I don’t feel you have to read the previous books to enjoy this one. And- best of luck with your writing. PS I was up reading the book at 2AM! Clare, I’m beginning to think you must be an owl. :) Don’t you ever sleep? ‘Banquet of Consequences’ must be good to keep you awake so long. I’ve been to Dorset a few times, and know where Shaftesbury, Sherborne and Yetminster are. Seaton is in Devon and Camberwell is a district of London – unless the author has a village with the same name in her book. Dorset and Devon are lovely counties, with very quaint villages and lovely scenery. The ‘south’ of England is generally less rugged than the north. High land increases as we go north, right up to Scotland. They do go to Cambridge in my most recent chapter. I think I’m a worse insomniac than you, Millie. (If that’s possible) I was asleep from midnight to 2AM and then woke up, went downstairs and read until 7:30. There are nights when I sleep for 6-7 hours, but not often. Especially if I’m working on a book. Beautiful photos, Millie. I miss my house at the shore, too! It’s funny how the sea can mean so much to so many of us. I was born by the sea, and will never be truly ‘at home’ inland. This is so interesting Millie! Thank you for sharing! Your home area is extraordinarily beautiful, Millie. It’s been almost 9 years since I visited mine. But I’m planning to do it soon. And thanks again for your lovely wishes. Hope your writing is going great as well! Beautiful! The dunes remind me of the dunes on the western part of my home state of Michigan. Such lovely childhood memories I have of there, too. I hope the red squirrels make a comeback! We had plenty of the grays in Michigan, so I’m more used to seeing elaborate feeders designed to keep the squirrels _out_ so that the birds actually get to eat. Good luck getting some writing in soon! Life intervenes, I know. 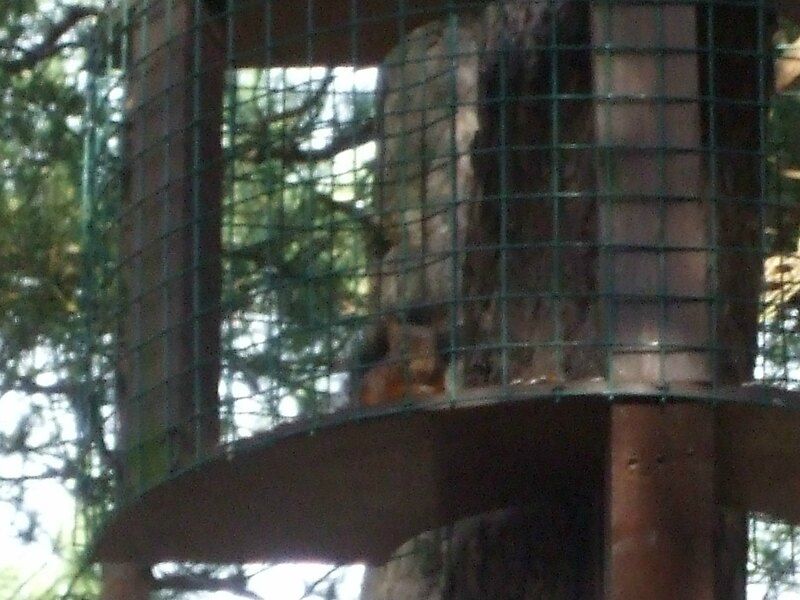 The grey squirrels are everywhere here, too. They were introduced here from North America and have bred a little too well! A lot of people hate them, and call them ‘tree rats’. Red squirrels are so rare now, but for lots of reasons, not just competition from the greys (directly, that is). I really should do a post about it, but I’ve already got a list a mile long to sort through. So glad you are doing well on the third book! What beautiful pictures of the dunes! Thanks Lynn. I do miss the dunes, and my home area – even after being away for almost fifty years! I’m spending some time visiting blogs this week, so I’ll be hopping over to see you soon. I’ve missed your posts! It’s good to be back, Lynn, if only for a few days. Oh I love these dunes! Thanks, Inese. 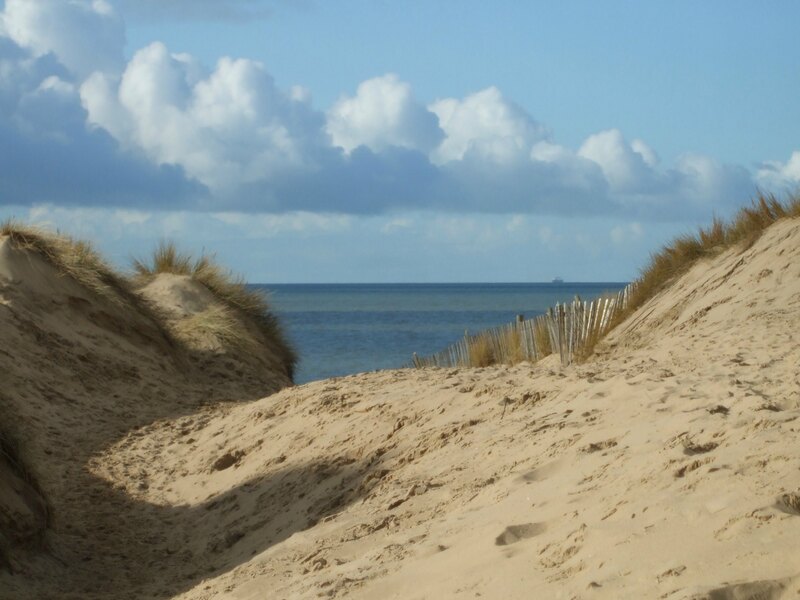 The dunes always remind me of my childhood – I rolled down them many times when I was young. I can’t stay away from them for too long. A yearly visit simply isn’t enough. Childhood spent near the sea is special. My aunt’s house stood right behind dunes. The pavement was always covered with sand. Every summer she invited me for a couple of weeks to stay with her. Unforgettable time. ‘Memories are made of this…’ How true the words of that old song are. Perhaps we’re just a couple of sentimental fools, Inese. (I deliberately left out the word ‘old’.) The sea – and the sandhills – have an allure that stays with a person forever. People from Southport were called ‘Sandgrounders’ for many years. In some places, they still are! Guilty as charged, I am sentimental, and my childhood is a big part of my total happiness. The sea and the dunes will stay with me forever too. Three years ago I spent two months near my sea. I will write about that some day.